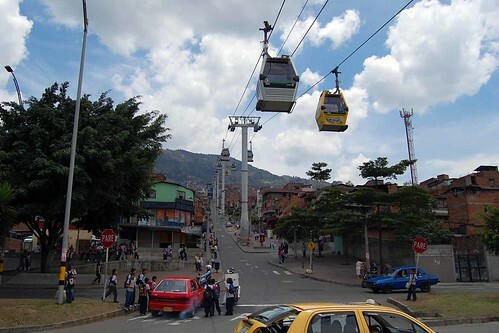 Monocable Detachable Gondolas (MDG) are likely the most common CPT system you’ll encounter as their low cost has made them an attractive addition to public transit systems in the developing world. MDG systems have been installed in cities in Bolivia, Colombia, Venezuela, Algeria, England, Singapore, and Brazil. Grip: As apparent in the name, an MDG uses a detachable grip. This means cabins can detach from the cable when in the station allowing for intermediary stations and turning (at stations). Cables: An MDG utilizes a single cable which provides both support and propulsion. Speed: About 6 m/s, which is equal to 22 km/h. Technological advances now allow speeds of up to 7 m/s. Capacity: Generally cabins hold 8 passengers with some systems allowing as few as 4 or as many as 15. This amounts to around 2,000-3,000 people per hour per direction (pphpd). Technological advances now enable MDGs to transport up to 4,500 pphpd. Towers: MDG systems are generally supported by cylindrical towers, although custom towers or lattice structures are also possible. Cost: Although cost is very dependent on location, situation, and customization, generally the cost for an MDG is between $5-20 million (US) / km. 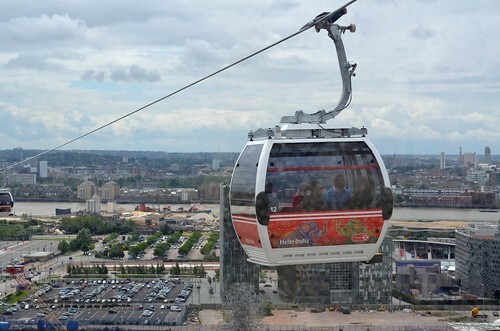 The Emirates Air Line (cable car) in London is a simple 2-station, MDG system that crosses the Thames River in London. CC Image by Flickr user Squirmelia. MDG are intermediate capacity systems (and comparable to many urban tram routes). Given their single cable are prone to stoppages due to winds in excess of 70 km/hr. MDGs are therefore most useful in most urban environments with low-medium capacity needs. As the investment is quite low compared to other technologies, MDGs are excellent “starter” systems for cities intrigued by the technology but question its effectiveness. They can act alone as mid-capacity main lines, or function as feeder lines to other higher order transit technologies (such as subways). If you’re looking for the original post on MDG technology, you can find it here.